Today was our first swimming lesson of the summer. Last summer, swimming lessons were really tough. I'd say she cried through about 75% of them, and every time her teacher had her sit on the steps she'd try to run away. She professed to love her teacher, and she loves the kiddie pool, but lessons in the big pool were an entirely different story. It wasn't until the end of the summer that we'd make it through a full lesson without tears. All winter, she's been talking about Jim. Jim helps me swim. Do you know who I swim with? Jim! Jim teaches me to kick! Jim blows bubbles in the water! I can't wait to see Jim! She saw Jim the day the pool opened and remembered him. When he asked if she was going to come swim with him again, she was so excited. To quote Yogi, "It's deja vu all over again". She cried, she fought, she tried to escape, and she had a full on tantrum in the pool as poor Jim, who is probably contemplating ear plugs for tomorrow, kept a smile on his face and towed her around, encouraging her to kick. There was only one other little boy in her group today (a year older) and he was eager to try everything Jim suggested. It was quite a study in opposites. Then I overheard someone laughingly say, "well, you can't make them love it". While this is true, and it wasn't said in a judgmental way, it rubbed me the wrong way. My own guilt that I am putting her into an activity that she sobs through - and paying for this privilege - was already rising, and knowing that her reaction was on display (trust me, you couldn't miss her) was making me anxious. 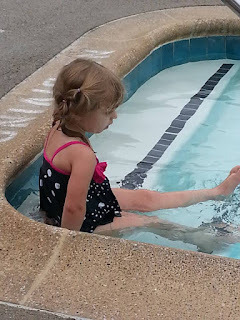 By the way, she adores the baby pool, and she's fine with "swimming" with floaties in friends' pools (her instructor hates them, but understands they are necessary in certain situations). It's when we've got her in the big pool without any props that she has an issue. Also, while these are not official parent/child lessons, I do stick around, in my bathing suit, and usually end up in the water at some point. Today Reagan wasn't with us since she was still napping, but most of the time, I'll be shadowing Jim with Reagan to give her experience in the big pool as well. 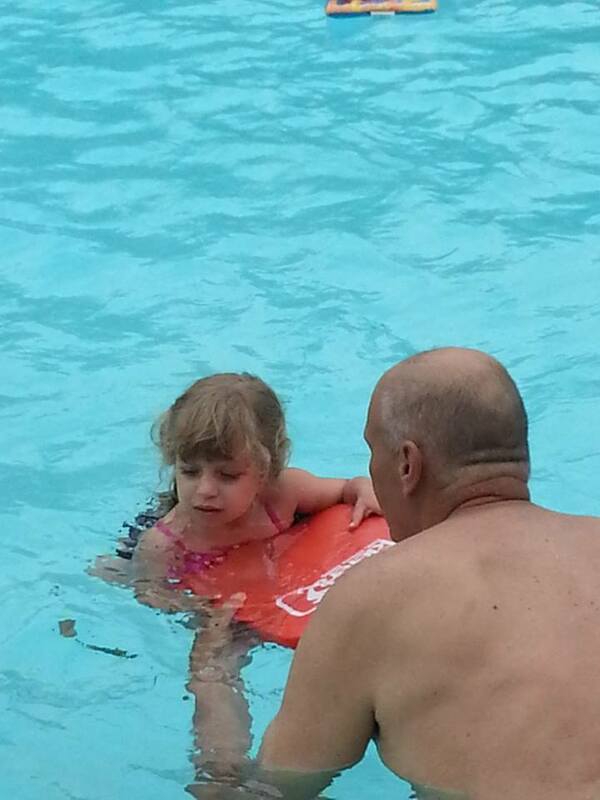 She IS considered too young at this particular pool. Madison barely snuck in last summer. Now if this was dance, if this was piano, if this was gymnastics, or soccer, or pretty much any other activity, I'd be considering how long to, for lack of a better term, torture her, before deciding that it just isn't an activity worth spending time, money and effort on. But swimming? I'm not bending. No, I don't think she's too young for lessons. No, I'm not letting her have a say. Adam and I (and Jim) are in agreement: learning to swim, and to be comfortable in the water, is not something we're negotiating on. We're not forcing her to join the swim team, we're not saying she has to become a water bug. I don't care if she learns specific strokes, learns to dive, or wins a race. I don't care if she loves it. The lessons stay. The fact is that she needs to a) not be scared of and b) have some idea of how to act in water. We're at the pool a lot over the summer and water scares me. There are far too many scary stories about kids and pools. Lifeguards are human, gates can be opened, a mere glance away is enough time for tragedy. I have two mobile kids to watch this summer. 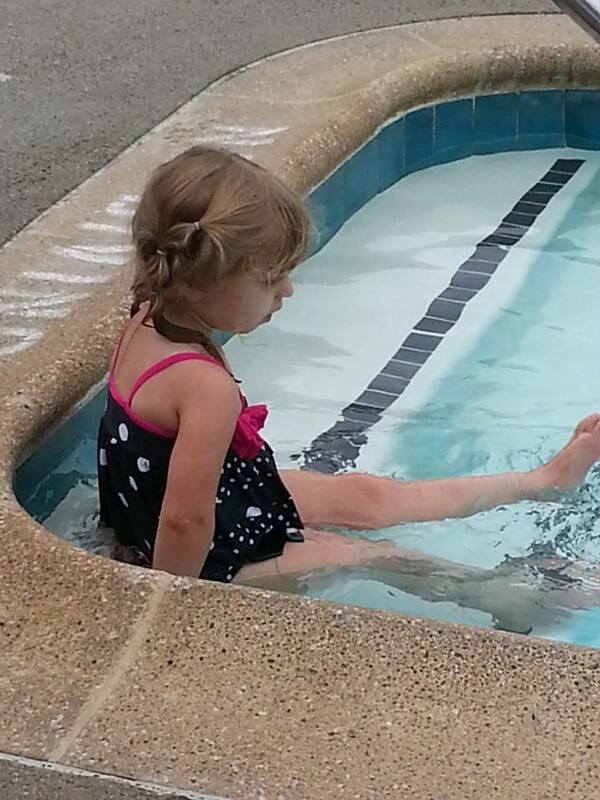 Swimming lessons won't make her drownproof - no one is ever completely drownproof. I will never stop being vigilant around the pool. But knowing that we've made the effort to get her comfortable in water makes me feel better. Saying "I'll just watch her" isn't enough for me. Her teacher is gentle and patient. He talks to her reassuringly as he tows her around. He reminded me today that for every month she's been out of the water, it'll take about a day to reacclimate. We've only been in the big pool a few times this year, and that was after ten months off. That means we probably have a few more lessons with screaming and crying. As much as it broke my heart and made me question my own judgment in putting her back into lessons, I know that I'm not torturing her. I'm giving her a life skill. By the time she was wrapped in her towel, the tears had stopped, the screaming was over, and she was high fiving Jim, telling him she'd see him tomorrow and asking if we could stop for a popsicle on the way out. I don't think we've scarred her for life. What would YOU do? If your kid cried throughout their lessons, would you stick with it? Would you stop? How long would you let it go?